My background keeps changing to the one offered in the Rotating images option, even though I select a specific image from the library. What am I doing wrong? 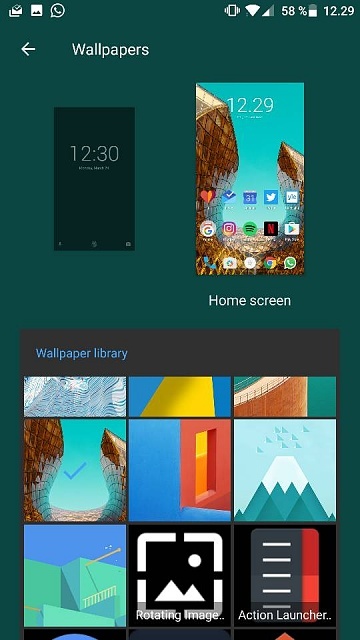 all you need to do is press the home screen-press on the image on right for home wallpaper- select the image you want to put on the home screen- again press the home screen option on the right and tap save. I hope you would be able to do it successfully. That's the problem, there's no Save button there after selecting the photo. Weird. Are you stock? Upgraded to OOS4.0.2? If so, have you wiped the system cache in the stock recovery? why is my mobile showing screen black when hang? Galaxy S6 Black screen HELP!! Touch functions work but cannot see anything!! Samsung galaxy s6 black screen of death with solid blue light?